My next fave record in this series is Dimanche a Bamako by Amadou & Meriam, which came out in 2005. I have to thank this record for introducing me to the amazing music that has come out of Mali over the years. I heard this album on the radio after it came out on WERS – a college radio station in Boston that wisely do not segregate their playlist. I used to listen to that station’s daytime show whenever I was in the car at that time because I liked the way they would play indie rock, classic rock, and so-called “world music” (a term I dislike for the obvious reasons) right next to each other. When I was in high school, the college radio stations I listened to played only white punk, post-punk and indie rock (it wasn’t called that yet at the time). Hearing Bob Dylan next to Caetano Veloso, or Sufjan Stevens next to Amadou & Meriam felt like a breath of fresh air by comparison. After buying this album, I went on to pick up records by Ali Farka Toure, Oumou Sangare, Toumani Diabate and Rokia Traore that have been among my favorite albums of the last 10 years. In addition to these artists from Mali, I learned more about artists from Senegal like Baaba Maal and Youssou N’ Dour, whose albums Missing You and Egypt I hope to write about later in this series. Like the first album I wrote about in this series, Wrecking Ball by Emmylou Harris, Dimanche a Bamako marked a substantial collaboration between the artist and the producer. But since I don’t know as much about Manu Chao as I do about Daniel Lanois, I can’t comment much on the role he played in making this record. (I actually don’t know much about Lanois either, but I had heard several albums he recorded before listening to Wrecking Ball.) The duo had been successful in France and West Africa before this record came out, but this album gained them new fans here in the US, and they went on to tour more widely in the wake of its success. What really struck me about this album was the guitar playing. It’s heavily layered without managing to sound heavy handed. Sometimes there are chord patterns that are incredibly catchy. (see: La Realite – note: I can’t add accents in this window, so pardon the linguitic crudite.) Sometimes there are arpeggiated riffs that move up and down scales in a way that never sounds distracting from the song, even though Amadou grew up loving guitar heroes like Hendrix & Clapton. What I like about these patterns is the way they remind me of swirling flames or patterns of smoke that burn up into thin air, rather than conquistador-style egotistical solos that call attention to the player at the expense of the song. Especially for the first 2/3rds of the album, the songs shine through under the support of the playing, rather than the other way around. 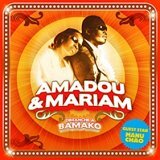 There’s a wholesome vibe and strength to Dimance a Bamako that no doubt comes a lot from Amadou & Meriam’s relationship. They’re a married couple with three children. Meriam often sings with her arm draped around her husband during their concerts. I also think that, like the first two records in this series, there’s a maturity of perspective that comes with the dedication this duo have shown to the way they slowly cultivated their work and audience over several decades. They are set to release a new album later this month, and the single Dougou Badia has already appeared. I look forward to checking out their new stuff. But don’t miss this earlier album. 14 Mar	This entry was published on March 14, 2012 at 1:50 am and is filed under Music, Record Reviews, Series of posts, Top 40 Over 40. Bookmark the permalink. Follow any comments here with the RSS feed for this post.